Mark Levin says the reason that Schiff and the rest of the Democrats and their Praetorian Guard media are fighting so hard, they’re not only protecting the Clintons, but more importantly, Hussein Obama. He notes that Obama’s name never comes up so he draws the connections for the audience. He disagrees with assertions of some Republicans, such as Rep Trey Gowdy, who are saying this has nothing to do with Mueller. “It has everything to do with Mueller because it transitioned from a counterintelligence investigation into a criminal investigation after Comey, of all things, confesses to being a leaker.” Levin notes that all of the people involved in orchestrating this are Mueller’s people, as a former FBI Director. 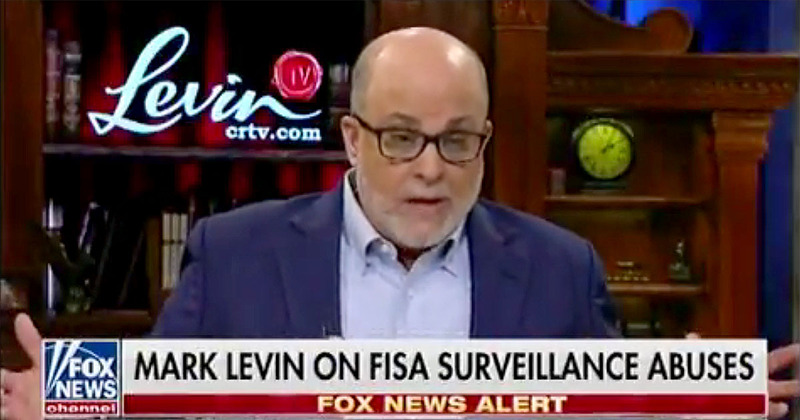 Getting back to Hussein Obama, Levin points out that “It’s his FBI, his Department of Justice, his State Department, his candidate. I cannot believe for a minute that the National Security Council didn’t know about this. I’m not sure he would accept, or be asked, but I think if Levin were AG, hoping he is not just establishment talk, would clean up the swamp. I am assuming his talk is his walk. I AGREE WITH THIS AD. now we NEED to PUSH THE PRESIDENT TO FIRE SESSIONS AND GET A REAL LAW AND ORDER AG, AND A NEW FBI DIRECTOR. JUDGE JEANINE AS AG, AND SHERIFF DAVID CLARKE AS FBI DIRECTOR.